COMMENTARY — The Tigers and the Soaring Eagle are meeting once again. About halfway through the Hurricane-Delta game last Friday, a 38-0 Hurricane win, people started talking about it. After the game it was the hot topic. In fact, nobody wanted to talk about the game that was just played. With a knowing look in the coaches’, players’ and fans’ eyes, everyone was talking about the game. Of course, it is such a hot topic because the only three times that Hurricane and Juan Diego have played each other were the three straight Soaring Eagle wins in the state championship game, 2008, 2009 and 2010. And it wasn’t just that Juan Diego won. The Soaring Eagle and the Tigers are so similar, teams with the age-old football concept of grind-it-out offense and hard-nosed defense. And all three years, Juan Diego did those things ever so slightly better than the Tigers, taking a 21-18 win in ’08, a 12-10 win in ’09 and a 10-7 win in ’10. This one will be a little different, at least semantically. The game will be played in Draper, on the Juan Diego campus, rather than at the University of Utah. And Hurricane, not Juan Diego, is the defending state champion. The Soaring Eagle got knocked out of the playoffs by Spanish Fork last season. But I expect this to be the same low-scoring, hard-hitting gridiron war as we’ve seen from these two teams in the past. And I wouldn’t be surprised if it came down to the last play of the game. Let’s hope the Tigers have the ball when that happens this time. As for the other playoff teams, I see Dixie and Desert Hills both as contenders for the state title. Realistically, you can toss out Morgan and Bear River. They’re both going to get whipped this week. Both Hurricane and Dixie have tough roads in that they have to win on the road against championship contenders. If they both manage to do it, they would face each other in a semifinal game that would have to be moved to southern Utah. Dixie plays at undefeated Stansbury, but I think the Stallions are beatable. They like to ground it out as well and have four great linebackers leading a defense that has allowed less than 10 points a game. But I don’t think Stansbury has faced an offense as dynamic as Dixie’s this season. The Stallions did hold Desert Hills to seven points, but the Thunder were playing short-handed with several players out with injuries. As for Desert Hills, they should have no problem handling Bear River. 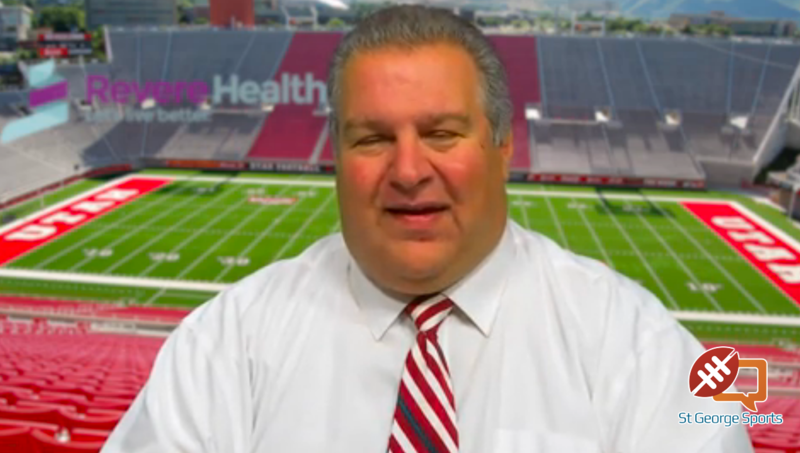 A ticket to Rice-Eccles Stadium is the reward if the Thunder can take care of business. Of course, we’ll have full previews and our podcast this Friday in preparation for the games. Morgan (7-4) at Spanish Fork (10-1), 6 p.m.
Bear River (7-4) at Desert Hills (7-3), 5 p.m.
Hurricane (9-1) at Juan Diego (11-0), 5 p.m.
Dixie (8-2) at Stansbury (11-0), 5 p.m.
A huge congratulations goes to the Region 9 volleyball teams. Not only did Desert Hills win the state championship, but the Thunder played region rival Snow Canyon in the title game. They were clearly the best two teams in the state. Plus, Dixie won three of four matches to take fifth place and Hurricane also went 3-1, finishing with a sixth place showing. It’s easy math, but most impressive. At state, Desert Hills was 4-0, the Warriors were 3-1, the Flyers 3-1 and the Tigers 3-1. All-totaled, Region 9 teams went 13-3 at state. That is impressive.